About the PysankaIt Is Written! This valuable resource is a unique compilation of more than 250 books, periodicals and audiovisual titles by an author who is knowledgeable and experienced in the ancient tradition of pysanky. When the author discovered that she could not find a published bibliography on pysanky she set about to write her own. The result is "About the PysankaIt Is Written! A Bibliography by Joan Brander". This colorfully illustrated bibliography brings together publications on the pysanka in Ukrainian, English, German, French, Portuguese, Italian, Polish and Japanese. The publishing and cataloguing of this first of-its-kind book garnered a place for "pysanky" in the bibliography class of the Library of Congress headings - a precedent setting development. 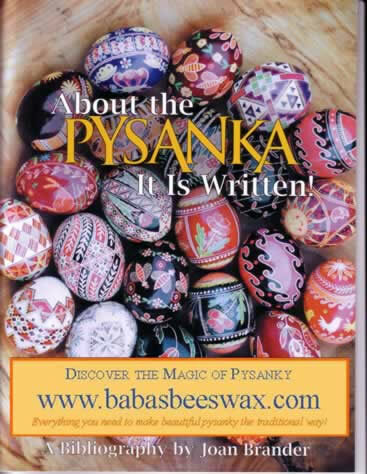 Select this link to watch a Pysanka Power Video Clip that flips through the pages of About the Pysanka - It Is Written! A Bibliography by Joan Brander. Chapters include pysanky books, childrens books, newsletters, articles, audio-visual, chronological index and author index. The book also includes 72 colour plates. See the book format, pages, colourful cover, and contents of featured pysanka resource books. The bibliography is a "must have" for anyone who is interested in pysanky, Ukrainian folk art, and heritage studies. There have been two book launches of "About the PysankaIt Is Written! A Bibliography by Joan Brander". 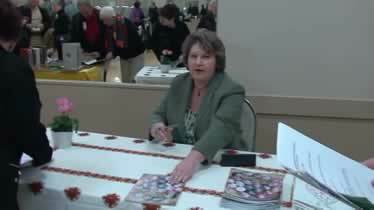 The inaugural book launch was held at the first U.S. Pysanka Symposium in Washington, DC on Saturday March 8, 2008. The book received a mark of distinction when it was announced that the Library of Congress assigned a first of-its-kind place in its headingsa unique development in the bibliography classification. Download the Press Release (February 2008). Watch video of the Washington book launch on YouTube. See a photo montage of the Pysanka Symposium on You Tube (and photos on Flickr here). Download the text of Joan Brander's Washington presentation (pdf file). Download the Nash Holos interview of Joan Brander (TBD). The British Columbia book launch was held at Ukrainian Community Centre of Ivan Franko on March 15, 2009. See photos of the Richmond book launch on Flickr here. Download the British Columbia invitation (pdf file). Download the text of Joan Brander's British Columbia presentation (pdf file). As the title suggests, this book About the Pysanka--It Is Written! 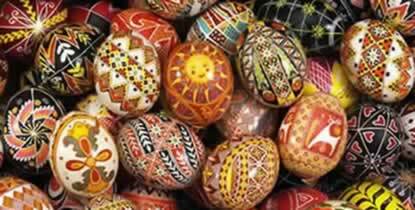 : A Bibliography is a bibliography of resources on the art of pysanka (Ukrainian Easter egg decorating). But seldom will you find a bibliography quite so colourful! It's tempting to call it "eye candy" but that wouldn't do it justice, because it is as useful as it is beautiful. The author, Joan Brander, first learned the art of pysanka from her baba (grandmother). As an adult, she perfected her craft with the help of a number of resources she collected over the years. Some were easier to find than others, so as an aid for future generations of pysanka artists, she decided to create an extensive compilation of resources on the art of pysanka. Incidentally, those familiar with the language and the art form will appreciate the title's clever play on words. The word "pysanka" comes from the Ukrainian word "pysaty" which means "to write." So to be linguistically correct, pysanka eggs are not painted (or even decorated) but rather written, using ancient symbols instead of words to convey a message to the intended recipient. This book, written with words and pictures, is a beautiful addition to any collection of pysanka resources, and a great starting point for those new to this ancient and enduring art form. Also available as Digital Book, PDF will be emailed separately.